With today’s smart home technology, there are more options for home security, including video surveillance, than ever before. You no longer need to rely on a traditional home security provider. You can monitor your home from any location, set alarms, and trigger calls to emergency personnel, all through your smart home system. Systems are completely customizable according to your needs and desires. Here’s what you need to know if you’re interested in surveillance and security for your home. The components you choose for your system will depend on your goals and what you want your system to do. The basics will include door sensors and window sensors, motion detectors, and the siren that’s triggered when the motion detector is activated. All of these elements are connected through a hub to your WiFi network and are controlled via an app on your smartphone. Beyond the basics, you can add several other valuable components. Smart door locks and garage door openers allow you to lock and unlock your door as well as open and close your garage door via your smartphone. (These are also handy if you’re expecting visitors but are out of the house when they arrive. You can unlock the door remotely after verifying the identity of the individuals at the door.) Lights that pulse when the motion detector is triggered can work in conjunction with the siren to scare off intruders. Smart smoke detectors and carbon dioxide detectors are also helpful. Not only can you set these devices to send you a notification when activated, but you can also set them to contact the fire department for help. This feature is especially useful if you have pets at home while you’re out of the house and you’re concerned for their safety. And smart water sensors detect leaks or flooding. Indoor and outdoor surveillance cameras are one of the most popular components that homeowners invest in. These cameras are motion activated. When triggered, they send an alert to your smartphone so you know when something is happening. 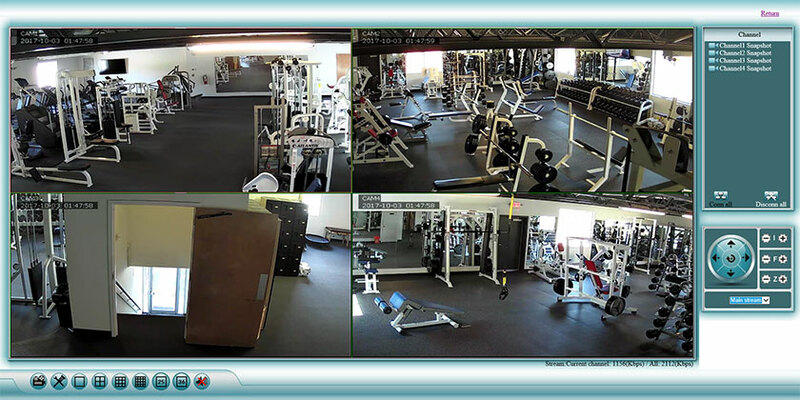 You can also set these cameras to record activity when triggered, so activity is captured on video. Low definition and high definition video cameras are both available, so you can select the level of quality you need. Each element of your security system should work together seamlessly. If you purchase components from the same company, you’ll be able to control all the elements from a single app. If you’re using different manufacturers or providers, you may need more than one app, but they can often be linked together using IFTTT. Many systems and components also offer voice control for even easier use. If you’re tech-savvy, you may be able to install your system yourself. Some all-in-one systems are fairly easy to set up, although you may want to add components not included in basic kits. If you want additional components or a custom setup, it’s a good idea to bring in a professional. You’ll save time, and the professional can ensure everything is set up properly to work the way it’s supposed to. Good professional installers will show you how to use the system and how to control each component via the app (or apps) on your smartphone. If you have questions about home security or video surveillance, give us a call at 864-881-1675. We’re happy to talk with you.